Earlier this year I posted a chart showing how Michael Pascoe's articles on Gold could be seen as a contrarian indicator (h/t SaturnV on HC for the idea) with many of them bearish on the metal yet appearing at lows or lulls in the price before a large spike higher. I have been wrong about the gold price for the past several years [At least he's honest! BB], but that still remains more a matter of timing than fundamentals. The major leg of the gold rally was based on a reasonable reason – the need for those with US dollars to get out of them as the American economy and the greenback plunged. The uninvolved might be under the impression that the price of gold has been soaring to record highs lately, some using that as an excuse to bid up the price of shares in Australian gold miners in the hope that higher gold price might flow through to them. Gold in US dollars is up 28 per cent over the past year, but it's done nothing for Australian investors. As I write, it's trading at $A1,441.03 an ounce – within a few cents of what it was worth this time last year. It's still roughly doubled since the start of 2006 with 2008 the star year as the GFC had its full impact. 7. 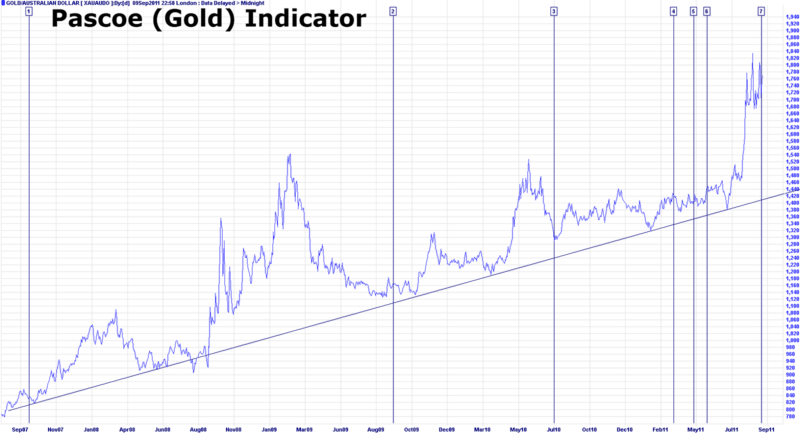 Finally only a few days ago (September 7th, 2011) Pascoe had more to say on Gold (LINK). His latest commentary comes following a $300-400 spike higher in the metal, so at this point it's difficult to gauge whether the "Pascoe Indicator" has broken or whether we are perhaps at the base of another solid move higher. But the fact that the gold price has gone up doesn’t mean that it’s not a bubble. To rephrase that and take out the double negative, the gold price going up is part and parcel of it being a bubble. In the 1630s when the price of tulips rose from 1000 florins to 2000 florins – several years’ average wages – it just confirmed there was a bubble, not that tulips enjoyed any particularly intrinsic value or that tulips would continue to rise indefinitely and/or hold their value. Pascoe has been calling the rise in Gold a bubble for years, but for something to be in a bubble that would indicate it is overvalued. I have yet to find any analysis from Pascoe as to what he considers it overvalued against. If Gold rises to nominal peak of $3000 and then following falls back to a low of $2000, was it still a bubble when Pascoe called it one at $1250 and lower? He suggests the bubble is similar to the tulip mania... does he understand that Gold's rise from undervalued to overvalued is a move that is cyclical in nature? He seems unable to comprehend the difference between a one time speculative mania and the cyclical nature of investment/monetary assets. Gold’s true believers think gold is different, that it does have some mysterious intrinsic value, rather than its price just reflecting the interaction of speculative supply and demand, with some physical jewellery demand on the side. I have no doubt that there is speculative buying in Gold driving the price at times, but given that some of the largest demand over the last couple of years has been Central Bank buying, does Pascoe also consider this to be speculative buying? Or does this demand fall on the jewellery side whereby Central Bank officials are turning the Gold bars into bling and wearing it around town? Pascoe claims that the intrinsic value of Gold is a mystery, but it's really not all that difficult to work out where Gold's intrinsic value comes from. Probably one the best explanations I've seen is in the first minute of this clip from movie "The Treasure of the Sierra Madre" in which a prospector provides the example of 1000 men that go looking for Gold. After 6 months only 1 of them is lucky. The value of the Gold not only represents the value from the labor of the one man, but also that of the 999 others that didn’t find anything (total 6000 months, 500 years worth of labor). We do things a little differently these days, but the principle remains the same. We have Gold miners today digging up 5-10 tonnes of earth (sometimes more) to retrieve an ounce worth of Gold let alone all the processing and refining that follows. For each company that succeeds there are thousands that fail (as pointed out in this post of mine two weeks ago). Now wait just a minute here... that number sounds a little high given that GLD (the world’s largest gold exchange traded fund) hold only 1240 tonnes. Wikipedia suggests that "As of 25 June 2010, physically backed funds held 2,062.6 tonnes of gold in total for private and institutional investors". I think Pascoe better check his sources more carefully! Support Bullion Baron -> Buy your Gold and Silver through this link.